In last few weeks I have got several mails and comments asking about the tax benefit on NPS. 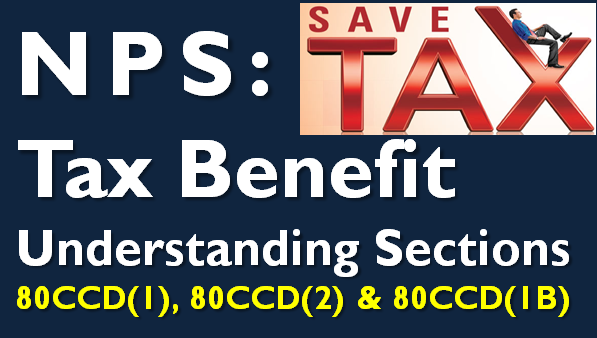 This post explains the tax deduction availa/ble for NPS under 3 sections: 80CCD(1), 80CCD(2) and 80CCD(1B). Tax Benefit on NPS Tier 1 and/or 2? NPS has two Tiers – 1 and 2. NPS Tier 1 is the long term investment, which has restricted withdrawals and meant primarily for retirement planning. On maturity, you can withdraw maximum of 60% of corpus as lumpsum and rest has to be used for annuity purchase. NPS Tier 2 is for managing short to medium term investment. You can invest and withdraw anytime as per your wish. This is an optional feature and you are asked if you need Tier 2 account while opening NPS. All the tax benefit related to NPS is available to investment in NPS Tier 1 account only. Also Read: When and How can Tax Benefits Claimed Earlier be Reversed? Employee contribution up to 10% of basic salary and dearness allowance (DA) up to 1.5 lakh is eligible for tax deduction. [This contribution along with Sec 80C has 1.5 Lakh investment limit for tax deduction]. Self employed can also claim this tax benefit. However the limit is 10% of their annual income up to maximum of Rs 1.5 Lakhs. Additional exemption up to Rs 50,000 in NPS is eligible for income tax deduction. This was introduced in Budget 2015. Employer’s contribution up to 10% of basic plus DA is eligible for deduction under this section above the Rs 1.5 lakh limit in Sec 80CCD(1). This is also beneficial for employer as it can claim tax benefit for its contribution by showing it as business expense in the profit and loss account. Self employed cannot claim this tax benefit. 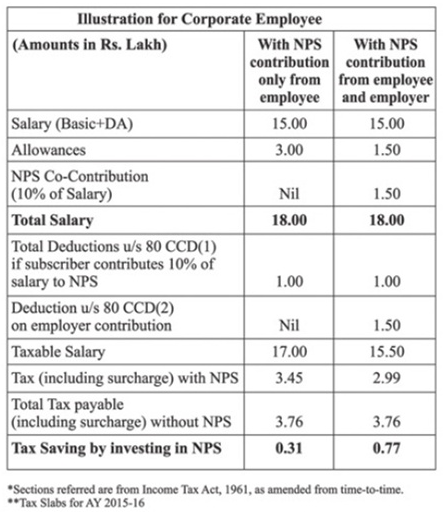 Below is the illustration on how introducing NPS can help you save tax under Section 80CCD(2). The earlier pension structure was replaced by NPS in most central and state government jobs since 2004. So anyone who joined after that has compulsory deduction for NPS. The deduction is 10% of basic salary and dearness allowance (DA) and the employer too contributes the matching amount. The confusion for most employees is how they take tax benefit on their compulsory NPS deduction? Let’s take the easy part first. Employee’s contribution in NPS would be eligible for tax deduction u/s 80CCD(1). I hope this would have cleared the confusion on how NPS helps you save tax. 80ccd(2) is only applicable for Gov. employee / employer ? can Private sector company give 80ccd(2) benefits to their employees ? Read your complete guide on NPS . I am a government employee, employer deducts NPS ₹72K, I don’t have any other 80c investments , I want to contribute 50k in NPS. Do I need to fill my 80C completely for 80CCD(1B) contribution, or I can contribute and directly claim 50k and claim tax benefit , but under which section I need to, show my investments while filing my ITR. Kindly help me out with your guidance . Both 80C & 80CCD(1B) are unrelated. Its your choice on how you want to show your NPS investment split. And anyway it would not impact your overall taxes. Hi sir. I am a GPF subscriber and m investing in NPS tier 1 can i avail tax exempted benefit under 80CCD(1B)? Kindly guide me my Tax savings. Sir, pl inform whether the employees covered under General Provident Scheme can enroll themselves in NPS scheme Ann can avail deduction s under Sections 80 CCE. In my new organisation which I joined in July 2018, there is no NPS. For April to June, 15000 has been deducted by my previous employer with matching contribution and paid into my NPS account.Now, can I continue contributing in my existing account. Where I have to contribute. In Tier- I or Tier-ii.